I don’t know how you can get any funkier than this. 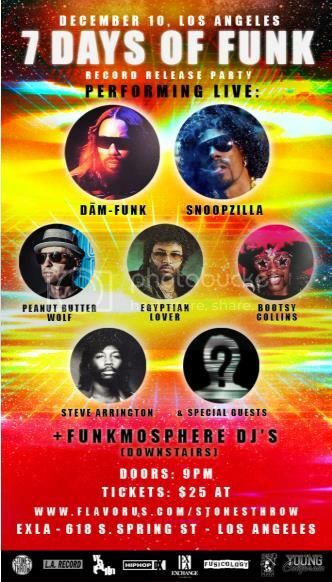 Walk Talkin is on deck for another Stone Throw Records extravaganza event…DAM FUNK & SNOOPZILLA (Snoop Dogg) 7 Days of Funk record release party. This special night features the main headlining event with a performance by DAM FUNK and SNOOPZILLA to prove to you that west coast dirty bass funk has never gone away and back in full effect. Also on deck the is the legendary BOOTSY COLLINS, EGYPTIAN LOVE, STEVE ARRINGTON and a classic video set by none of than PEANUT BUTTER WOLF. Dam Funk’s Funkmosphere Djs will be in the gallery stage throwing down their brand of boogie funk all night long. NextTHE REBIRTH releases new single and video…finally!